In the past few months, it seems we’ve made great leaps in the race to curb global warming. In early October, 191 countries signed the world’s first agreement to curb greenhouse gas pollution from aviation. On October 15, nearly 200 nations agreed to phase out hydrofluorocarbons, another greenhouse gas. And on November 4, last year’s historic Paris climate agreement will enter into force. But for every advance we make, new evidence emerges that the world is heating up faster than we could have imagined. Even if the measures pledged in Paris last year are implemented, the world is on track to an average temperature rise of about 3C over the next 50 years. That’s enough to render many of the world’s poorest countries uninhabitable – including much of Africa. It’s clear what countries have to do in Morocco at COP22, the latest global climate talks. They have to turn the Paris pledges into immediate action. They need to revise those pledges upwards, to have a chance of limiting global warming to less than 2C, the Paris goal. And they must focus their action on the world’s most vulnerable countries. When it comes to climate change, many African countries are doubly vulnerable. They are often the first to feel the effects of global warming, despite having contributed little to climate change. And they lack the finance, technology and capacity they need to adapt to those effects. They need more resources, skills, systems and institutions. With the limited means that it has, Africa has shown that it can be a world leader in renewable energy. The Africa Progress Panel —Chaired by Kofi Annan, of which I am a member, spelled this out clearly in its 2015 report, Power People Planet : Seizing Africa’s Energy and Climate Opportunities . 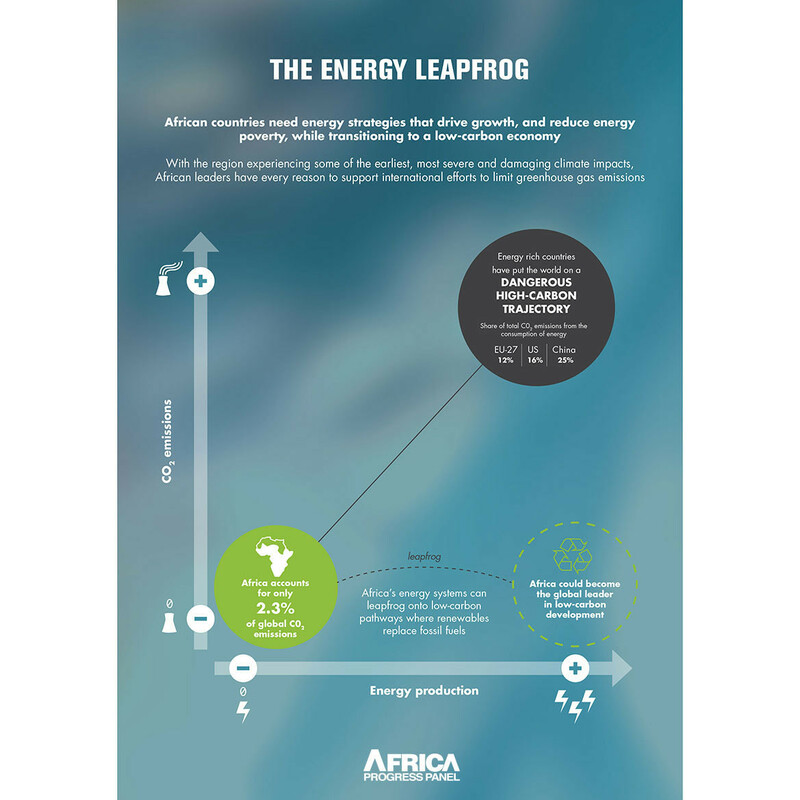 Africa could lead the world in every kind of climate action. But it needs sustained assistance. Developed country governments and international finance institutions have a duty to help Africa. Supporting Africa is also a crucial investment in the future of the planet. Africa may have contributed little so far to climate change, but the continent’s population is set to carry on rising for many decades, which will mean more greenhouse gas emissions unless Africa gets the help it needs. We know what we need to do. The Paris Agreement spells it out. We need to cut greenhouse gas emissions (mitigation). We need to cope with the effects of global warming (adaptation). And the countries that are suffering harm from climate change, or “loss and damage”, need compensation. Those are the ingredients. But in Africa the recipe is different from elsewhere in the world. African countries need more support for adaptation than they are getting – and more compensation for “loss and damage”. The Paris Agreement also outlines the kind of support countries need: finance, technology and capacity building. Once again the combination in Africa is different. The need for finance is large and urgent, as is the need for capacity building. How can countries make sure at COP22 that the world’s most vulnerable regions get the assistance they need? It is imperative that every country in the world shows that it complies with the letter and spirit of the Paris Agreement, by acting to keep all of its climate pledges. Crucially, universal compliance with the Paris pledges means coming up with the money that is vital to enable every country to reduce emissions and adapt to climate change. In Paris, countries agreed to jointly come up with $100 billion a year in climate finance by 2020. At COP22, they must finalise the “roadmap” towards raising that sum. Countries who will receive part of that $100 billion need to know when and how much they will get, so that they can plan their adaptation measures and their transition towards a low-carbon economy. They also need to know how much they will get from two other climate funds, the Adaptation Fund and the Least Developed Country Fund. At the COP22 meeting, its likely delegates will celebrate the entry into force of the Paris Agreement. And so they should. But the best way they could honour that historic agreement is not just to keep it but to reinforce it. A key aspect of the agreement was its commitment to regularly revising its targets. A mechanism has been put in place to do that — the Facilitative Dialogue. Countries need to lend it serious support. If we needed another spur to action at COP22, it arrived in September. The World Meteorological Organization announced that global average CO2 levels had just surpassed 400 parts per million – for the first time in 3 million years. Three million years ago, when CO2 levels were last as high as they are now, global temperatures were as much as 3C higher than now. Ice sheets were dramatically smaller. Sea levels were up to 3 metres higher. That’s the scenario we face. We know what we have to do to avoid it and to contribute to keep for our children a world inhabitable.